Au Revoir France, Hola Espana! 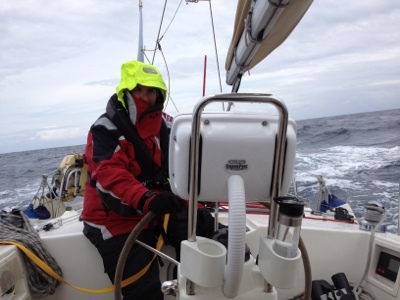 On Thursday at midday we started our journey to cross the Bay of Biscay. The weather forecast was good – moderate swell and wind strength and the wind direction moving from SW (the direction we wanted to go) to N/NW. We had already reefed the main so that we didn’t need to do it as we went along and had a cracking sail for the first 27 hours with our extra crew member, the hydrovane, doing the steering and the swell manageable. Then the wind died and we had to put the engine on for the next 12 hours. We decided to head for Gijon (pronounced Hihon) rather than Santander which was where the wind was originally sending us as it is further along the coast towards the north west corner. Then the wind picked up and so did the sea state with the swell now at least 2.5 or 3 metres high. The swell is fine if there are long gaps between each wave or roller but it gets more difficult when the seas get steeper as the waves get closer together. We put a third reef in the sail and made good, if lumpy, progress. We were blessed yet again with dolphins playing in our bow wave at dusk and through the night until the next morning. Inevitably, the wind died again and was in the wrong direction so we made the decision to motor again so that we made landfall in the light on Saturday evening. Only having the two of us on board meant we had to have a watch system of three hours off and three hours on. By the end of the journey, we were both tired and ready for a long sleep as both our sleep patterns had been wrecked. We arrived at Gijon at 6pm on Saturday having clocked up over 300 miles in the end rather than the 260 miles it would have been from Belle Ile to Gijon direct. This is what happens when the wind is in the wrong direction! We will now spend a couple of days here recovering and cleaning the boat as she and we were completely encrusted with salt. The shower on Sat eve was wonderful and we treated ourselves to a meal out in the marina – 24 euros for steak, chips and salad washed down with a very nice bottle of Rioja. 5 Responses to Au Revoir France, Hola Espana! Great to hear your progress.Weather in Spain wonderful. Congratulations….. And more photos of the epic voyage please?